Antonio Vivaldi's sonatas for violin and basso continuo are among the most valuable works written, and indeed, are of importance comparable to that of the violin sonatas of Corelli and Bach. Within this collection of sonatas, Vivaldi presents a multi-faceted spectrum of forms and possibilities with respect to performance and expression. The new Wiener Urtext Edition is based on both the first Venetian edition and an edition from late 17th-century/early 18th-centuryDutch publisher Estienne Roger. Drawn from these sources, we now have a much more logical musical text. 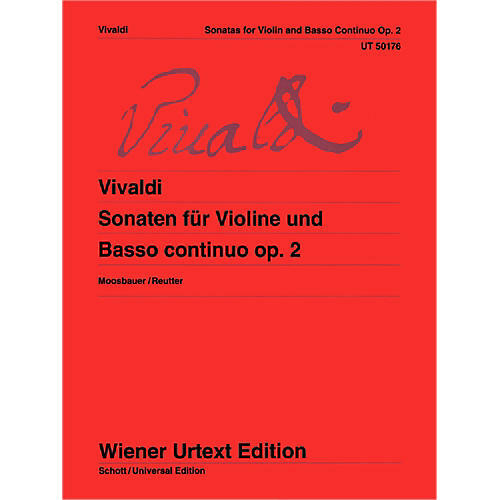 This edition contains a solo violin part and a continuo score with realized basso continuo as well as a figured bass part, giving experienced continuo players the opportunity to improvise on the basso continuo part, and can also be used by a continuo cellist. For intermediate to advanced-level players.